Tycho McManus/Assistant Photo Editor Freshman forward Ben Ovetsky was credited with an assist on Saturday. Following the form of its last five home games, the Binghamton men’s soccer team’s match against America East-rival Hartford was decided by just one goal. Only this time, the Bearcats (3-8-0, 1-0-0 AE) emerged on the victorious end of that 1-0 mark, earning their first home win of the season and their first overall victory since Sept. 7. Mired by a slew of close and late losses, the Bearcats set their frustrations aside and took a step toward changing the course of their season, when, in the 12th minute of Saturday night’s match, senior forward Steven Celeste converted on a cross served in the middle of the box. Both freshman forward Ben Ovetsky, who initiated the play in firing a long pass from the left sideline, and senior back Derrick Ladeairous, who received the pass and crossed in front to Celeste, were credited with assists. The goal was a long time coming for Celeste, who was last year’s leading scorer with four goals on 27 shots. This season, he’s already accumulated 18 shots through 11 contests, which leads the team. Graduate student midfielder Tommy Moon is the only other Binghamton player to have broken into double-digits in shots, with 13. Moon has also scored just one goal in 2014. 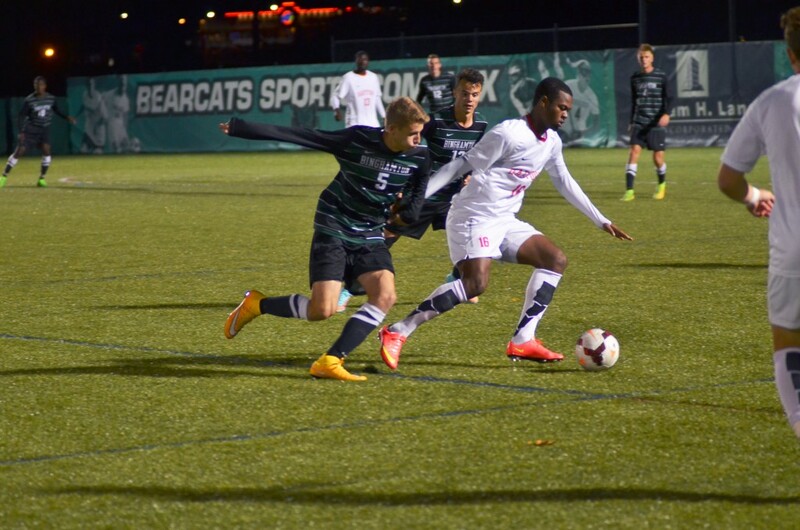 Unlike many of the Bearcats’ previous match-ups — which all had scoreless ties well into the second half — Saturday’s game saw Binghamton capitalize on its scoring opportunities early. The Bearcats played with fervor from kick-off, but the quick goal energized the team even more, allowing the Bearcats to protect their first home lead of the season and triumph over a team they hadn’t bested since 2010. Hartford (4-4-2, 0-1-0 AE), which was predicted by AE coaches in the preseason poll to finish second in the conference this year, provided a unique challenge to Binghamton in the speed of its players. But Binghamton responded adequately and specifically well in one vs. one defending. The match marked the opening of conference play for both teams. In their AE debut, the Hawks outshot the Bearcats, 10-7, but sophomore keeper Robert Moewes recorded three saves en route to his first collegiate shutout. What was perhaps the Hawks’ best opportunity of the night came in the 35th minute. Junior forward Javoni Simms — who netted the game-winning goal that knocked Binghamton out of last year’s AE Tournament in the teams’ quarterfinals matchup — rifled a shot straight at the goal, but Moewes dove to deflect it, accounting for one of his three saves that night. Saturday night’s 1-0 triumph comes on the heels of a disappointing loss to Hofstra last Tuesday. With just nine minutes remaining in regulation, senior defender Daniel Grundei scored off of a rebound in front of the goal. Despite the Bearcats’ best efforts to respond, putting up two shots and corner kicks in the final minutes, time cut their efforts short, and they shouldered yet another 1-0 loss. Next up for the Bearcats is another conference game. They’re slated to host University of New Hampshire at 1 p.m. Saturday at the Bearcats Sports Complex.